Is your bathroom needing updated, but you want to keep the main fixtures and fittings? 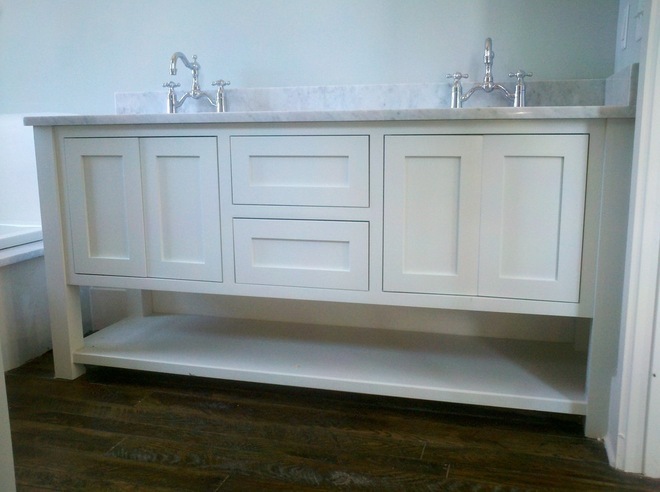 Then one option available to you is to consider buying replacement Shaker bathroom cabinet doors. By doing so, you can completely change the look of the bathroom without having to call in a plumber, but how do you go about trying to choose the right door for your bathroom? If you are confused, then the advice that follows may prove to be rather useful. Why would you replace them? As with Shaker kitchen cabinet doors there are a number of reasons as to why you would go ahead and replace the doors in your bathroom. Obviously you can do so when you want to update the overall look, but at the same time it could also be due to you buying an inferior product, or perhaps inheriting it if you bought the house with the cabinets installed, and the heat and moisture in the room can take its toll. The last thing you want is to have a damaged door that is constantly being warped by the moisture as it can have a knock-on effect with the rest of the cabinet, so surely it is better to just change the doors at the earliest opportunity to save yourself a bigger repair job in the future. What is the style you are after? As is to be expected, there are a number of different styles of bathroom cabinet doors available and it does mean that you have a number of options available and should be able to get one that is just perfect for your room. A number of people quite like the heavily embossed style of door for the bathroom and the chunky look is certainly one that has been in vogue for a number of years. This type of door looks more impressive when it is a larger bathroom because in smaller rooms this chunky appearance will be too dominant and overpowering. Instead, with smaller rooms look towards a smoother door with only light relief on it along with an appropriate handle and you should have a style that is perfect for your room. Next, you need to think about the type of wood that you should use and just as with the style there are a number of options available to you. The rules when choosing these doors are basically the same as they are with a kitchen in that you need to think about the space, light, and the overall look you are hoping to achieve when trying to choose your new doors. As like before, avoid dark wood such as mahogany in a smaller room with only artificial light or the bathroom will feel even smaller than it actually is and it will certainly not be as welcoming as it should be. The good news is that you are able to choose from basically every type of wood imaginable, so choose carefully and you should have a bathroom that does look amazing. How to choose the correct doors. After learning more about the styles and the wood available, it is certainly a good idea to turn attention towards how you can choose the correct doors to suit your particular style. As was previously mentioned, you need to look at the room itself in order to get some inspiration and even though the light and size of the room plays a part it is also advisable to look at areas such as the fixtures and fittings as well as the floor for your inspiration. Why is this important? The reason is that everything should blend in perfectly in your bathroom as it should be a place where you feel you can relax and that will not happen if everything appears to be rather disjointed. Is the floor plain? Then how about a door that is equally as plain or with some slight decoration on it as the contrast between that floor and a heavily embossed door could be too much and destroy the room. Is the floor light in color and the room quite spacious? Then how about a door that uses a darker wood in order to give that quite striking contrast in color? Do you have a light floor, but a small room? Then choose a wood that is only a shade or two darker than the floor and pick handles and hinges that are a lot darker in order to give the more subtle contrast that will work exceptionally well. Finally, think of the style you are after with plain being a bit more modern while a chunkier door is certainly seen as being a bit more traditional. Tie this in with the rest of the points made above and by the end of it all you should have been able to choose the perfect replacement bathroom cabinet doors at the first time of asking. How to ensure that the moisture does not damage it. Clearly a bathroom contains a lot of moisture, so if you buy the wrong replacement Shaker bathroom cabinet doors it could lead to all kinds of problems developing. Instead, you need to make sure that the doors have been treated in the correct way in order to make them resistant to water and life is certainly a lot easier when it has already been done for you. The best way to do this is to buy quality Shaker doors from the start because even if they have just been veneered it does mean that it will be thicker than normal and less likely to be damaged by the moisture. Spend that little bit extra to save yourself more money and problems in the future. Choosing replacement Shaker bathroom cabinet doors to suit your room is, therefore, relatively straightforward as long as you take the points mentioned above into consideration before spending money. There are a number of styles available that will not only fit every need, but also every budget, so think carefully about the look you are hoping to achieve, and then carefully browse through the options to ultimately settle on the cabinet doors that will just set your bathroom off perfectly.